If you are like most business owners you understand that you need to get reviews online. Easy right? Not so much! Almost all small businesses struggle to get consistent reviews on their listings. Now this can be for a number of reasons but one that we find happens most often is that they just don’t know how! In our experience there are a couple different things you can do, but most importantly is just to ask! Make asking for a review part of your follow up process. Send them a link to your properties and ask for a review on any of them (we tend to focus on Facebook and Google). Facebook links are straightforward – Facebook.com/yourbusinesspagename/reviews. Google, however, constantly changes the way the URLs are managed and each search results in a custom URL being created. Therefore, the URL will not remain the same! Google also does not make it easy for you to send a direct link to your page. Yes you can ask them to Google you, find your Business listing and leave you a review but that is a couple of steps, and when it comes to getting someone to do something online – the fewer steps the better! What if we could create a direct link to your Google My Business reviews that will automatically pop up a review box ready for them to populate? Simple, easy, and straightforward just like Facebook’s review system. Luckily a company that specializes in reviews has built a tool that will generate a direct link for you! 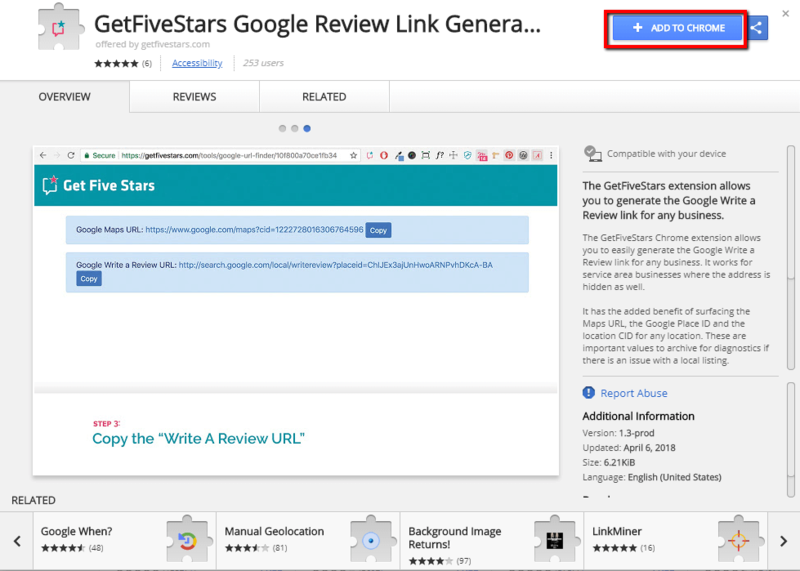 Get Five Stars built a free chrome browser extension that when enabled will give you a direct link to your map listing and reviews. Input this link wherever you would like – email, website, etc. Note: Be careful whenever adding any extensions or downloading anything from the internet, although we have used this extension in the past we are not affiliated with or have any control over it’s safety or how it collects/uses data. Add the extension at your own risk. If you would like us to provide you with a link for your business let us know and we would be happy to do so. Learn more about the importance of customer reviews! For users to be able to give you a review on Google they will need to be logged in. The direct link will prompt them to log in if they are not already. The account used for reviewing does not need to be a gmail account. This is a common misconception. Any account used to access any Google property (Analytics, Youtube, Gmail, Play Store, etc.) can be used to leave a review.